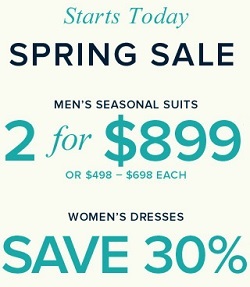 Spring Sale is here at Canadian Brooks Brothers stores. Here are examples of great deals: men's seasonal suits 2 for $899 (or each $468 - $698). Women's dresses 30% off. Women's and men's accessories 30% off. Selected kids styles also with 30% discount. More detail about this amazing deal at Canadian stores.